Today’s post is a shot of the patio bar outside the Paisley Violin Cafe. We stopped there on our photowalk last Saturday to grab something cold to drink. So much of what’s interesting in the area is BEHIND what you see from the street. The front of the Paisley certainly catches your eye from the street, but the really interesting stuff is in the back–a group of small artists studios in various colors, a patio bar, a fountain, big shady trees, and outdoor art installations. If you don’t get out of your car and use your feet to carry your eyes around, you miss a lot of really cool stuff! I love this shot, even if the composition isn’t the greatest. 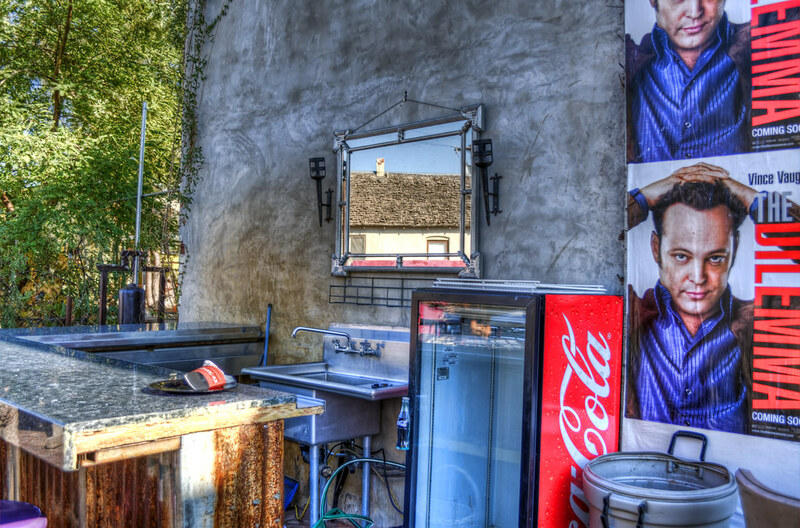 This HDR was created from three hand-held brackets, and I just love the little details that make up the image–the empty Coke machine, the movie poster, the leftover fast food wrappers on the bar, and especially the mirror over the sink that reflects the house across the street with the wooden shingles. This entry was posted in Commentary, Information, Processing and tagged architecture, Arizona, AZ, bar, camera, D5000, Grand Avenue, HDR, mirror, movie poster, Nikon, Paint Shop Pro, Paisley Violin Cafe, patio, Phoenix, photography, Photomatix, software, Topaz. Bookmark the permalink. any? Please permit me recognize so that I may just subscribe.